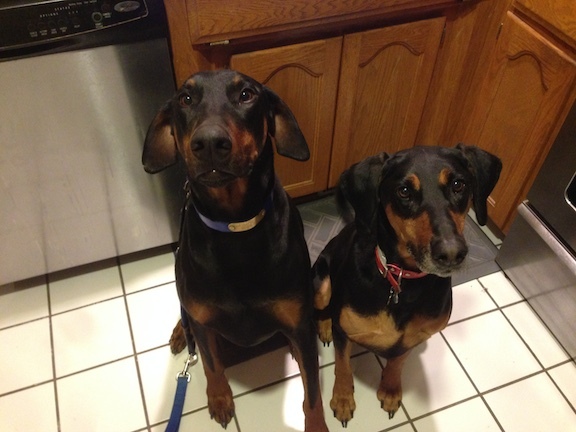 Judah (left) is a five year old Doberman Pincher. He lives with Olivia, a six year old German Shepherd / Doberman mix. Their owner called me to put an end to the sporadic fights that have erupted between the two dogs. When I arrived for the session, Judah was muzzled due to the number of Vet visits that have been required when they get into it. Both dogs greeted me at the door but neither had an over excited or anxious energy to them. I sat down with their owners to discuss the situation in detail. During our discussion I could see that Olivia was slightly needy, frequently moving toward and invading the sale of any human she wanted attention from. She wasn’t aggressive about it, but she also didn’t have any hesitation in nudging anyone who didn’t immediately start to pet her. While this was going on Judah remained aloof; observing but not interacting with me or Olivia. Now these dogs are not mortal enemies. In fact they like to run and play with one another. Even following the six or so fights that had occurred, 10 – 15 minutes later they were best buddies again. What confounded their owners was the seeming lack of warning that anything was wrong before the fights broke out. I went over some basic body language warnings that they should look out for such as staring, raising of the hackles, a glazed over look, lowering of the head, stiff or frozen body position, holding of breath or accelerated breathing, etc. While dog communication is often pretty subtle, knowing what to look for can go a long way towards stopping a fight before it starts. I have found that the stare is often the first communication in these situations so I showed their owners a few ways to get the dog’s attention when they see either one staring at the other. In discussing the fights and the situation surrounding them, one common factor seemed to be excitement. Its not at all uncommon for dogs to develop behavior issues due to over stimulation or excitement so I went over a number of different ways for their owners to help the dogs calm down. It can be pausing when the dogs start too get excited about going for a walk or eating, teaching them to sit and wait at an open doorway until they get permission to go out instead of running freely, etc. Daily life often provides us with multiple opportunities to practice being calm each day. Instead of avoiding these activities altogether, I stressed how they are in fact opportunities to practice remaining calm. Usually when dogs fight or are aggressive, its due to their not seeing or respecting their owners as being authority figures or having the situation under control. When the dogs think this is the case, the feel that they need to take care of things themselves. So in order to stop the fights that had popped up, my primary goal was to change the dog’s perception of their owners. I went over some basic forms of non verbal communication so that they can use body language, movement and eye contact to let the dogs know they are serious. I also underscored how important it is that they follow through with the dogs. Whether giving a command, correction or disagreeing with an unwanted behavior, the human needs to stay with it until the dog shows that it understands or gives the owner what they want. While this can be frustrating, spending a week consistently following through this way often coaxes the dog to change or modify their behavior to match. Next I went through a few leadership exercises to help the dogs practice looking to their owner for guidance and self restraint. Because both dogs are so intelligent, it didnt take more than a few repetitions before they figured out what the exercise asks from the. I coached their owners through the exercises until they had them mastered, then I went over ways to make it more challenging. Just like any other skill, practice makes perfect. By the end of the session the dogs were completely calm and were responding to the new forms of communication. Most of the work in the session was focused on helping their owners assume a more authoritative position so that the dogs saw and respected their authority. I suggested that they continue to use a muzzle on Judah for the short term. When they feel that they dogs are seeing them as authority figures and have learned to self restrain, then they will be ready to start letting them interact sans muzzle. It will take some time, but because of how smart the dogs are and how committed their owners are to solving this issue, Id be surprised if they can’t nip these sporadic fights in the bud in no time.